Competitions: local, national and overseas. an award-winning women's a cappella harmony chorus from Melbourne, Australia who provides inspiring and energetic weekly rehearsals. Members come from all walks of life and ages range from 18 to 70+. Learn more about us. Musical excellence, education and the encouragement of camaraderie, confidence and community involvement, while sharing the joy of a cappella, four part harmony, barbershop style. Join Us! 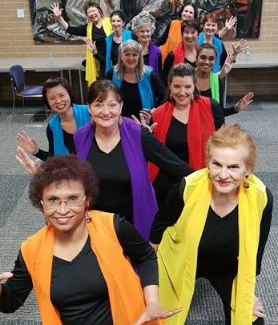 Melbourne Chorus is part of Sweet Adelines International, the largest organization for women singers in the world, with over 25,000 women singers in 10 countries around the globe. * My sister and I wanted an activity that we could do together. We read an ad for Melbourne Chorus and saw them singing in Kings Domain on Australia Day. I wondered if I could do that. We went along for the recruitment drive and here we are 10 years later.